Aufgabe des Wettbewerbs ist es, einen neuen Hauptsitz und ein Kongresszentrum für KFAS, jedes Gebäude mit einer Netto-Nutzfläche von ca. 11.000 qm, zu entwerfen und starke räumliche Verbindungen und einen Freiraum zu schaffen. Entwurf durch einen Masterplan zwischen den neuen Gebäuden und angrenzenden naturwissenschaftlich-technischen Funktionen, die sich derzeit in dem Gebiet befinden. 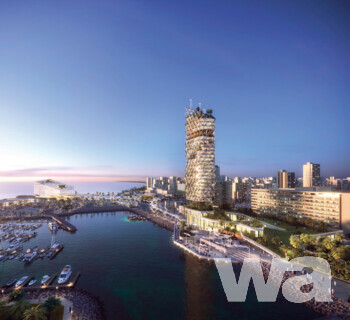 The task of the competition is to design new headquarters and a convention center for KFAS, each building with an approximate net utilization area of 11,000 sqm, and to establish strong spatial connections and an open space. Design through a master plan between the new buildings and adjacent science and technology functions that are currently in the area. The Kuwait Foundation for the Advancement of Sciences (KFAS) was founded in 1976 under the patronage of an Amiri Decree. As one of the most ambitious institutions of its kind in the Arab world, KFAS is a private non-profit organization dedicated to supporting the progress and advancement of science and technology. The main objective of KFAS is to stimulate creative initiatives and build a solid scientific and technological base while at the same time creating an environment that encourages innovation. Current projects include the organization of congresses with international scientists, the operation of a diabetes research facility and of the KFAS Scientific Center and a public science museum dedicated to widen public awareness of science. KFAS also works with talented and gifted individuals and gives them the financial and practical support they need to turn their ideas into reality KFAS has joint ventures with international companies, supporting them in the education of staff for the region. KFAS expects forward-looking, innovative and cost-efficient processes with the aim of achieving the highest sustainability standards in its new project. The new buildings should offer a flexible and modern working environment for its staff. Through the launch of its very first international competition, KFAS envisions to evoke a science and technology-based design approach for its buildings and to initiate the development of a science district with international reputation. 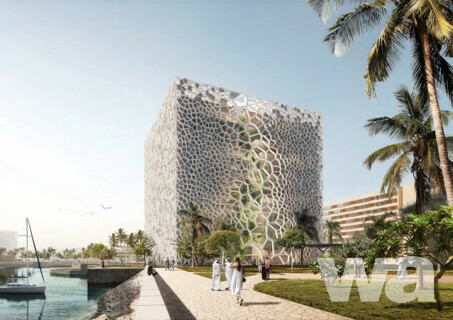 This competition and the realized buildings are expected to become a future model for developments in the Gulf region. An awareness of the cultural and social context of the Gulf and of Kuwait through previous work is highly valued. The competition area is situated at approx. 12 km east of the center of Kuwait City, in the northeastern tip of the peninsula of the District of Salmiya. While the study area for the master plan is nearly 60 hectares in size, the plot of land for the new KFAS Headquarters measures approx. 9,000 sqm and the project site for the new KFAS Convention Center measures approx. 5,600 sqm. Important buildings inside the study area are characterized by commercial, cultural and public use and science and technology (SIT) organizations in particular. It is home to The Scientific Center of Kuwait (TSCK), Kuwait Foundation for the Advancement of Sciences, Kuwait Institute for Scientific Research (KISR), Environment Public Authority (EPA) and Public authority for Agriculture Affairs (PAAFR). The competition is organized as a two stage, restricted, international, project competition with prior open pre-qualification procedure. The procedure will maintain the competitors’ anonymity. The language of the competition is English. The procedure is organized in agreement with the Union Internationale des Architectes (UIA). Following the open prequalification process selected design teams are encouraged to showcase their creativity and potential through their concept ideas in the first competition stage. Envisaged to promote science and fulfill the growing capacity of the foundation the competition will be finalized after the selection of the winner from the shortlisted design teams in the second stage where they are invited to present their final designs. The competition invites professional teams from all over the world to apply for the challenge of designing the new KFAS Headquarters and Convention Center. 40 to 60 architects or groups of architects or architect consortia shall be selected to participate in stage 1 of the competition. The selection committee will comprise representatives of the promoter as well as independent architects of different nationalities. Based on each entry’s merit in Stage 1, the jury will select in its meeting at the end of Stage 1 approx. 10 participants, but at least 6, for participation in Stage 2 of the competition. The admission area in the pre-qualification stage is unrestricted in terms of countries and regions. Eligible for participation are individuals who, on the day of the announcement of the competition and pursuant to the legal provisions of their country of residence, are entitled to use the occupational title “Architect” and work independently as freelancers. Individuals from countries where the occupational title “Architect” is not subject to statutory regulations are eligible, provided that they hold a degree or submit any other evidence of qualification or practice permitting them to exercise as architect in their country of residence. Eligible for participation are also architect consortia formed of individuals and legal entities that include at least one person eligible according to the previous paragraph. Legal entities are only eligible in such consortia if their statutory objectives include planning activities relevant to the competition task. Legal entities and architect consortia must name a single authorized representative who will be responsible for the fulfilling of the competition requirements according the eligibility for individuals. The authorized representative as well as all authors of competition entries must meet the eligibility criteria applying to competitors. Notwithstanding the designation of a single authorized representative, each member of any consortia shall be jointly and severally liable for any submission from its consortium. The promoter will provide the net amount of USD 530,000 (net) for prizes and honoraria for services rendered. The total amount was determined in relation to the size of the project and in respect of the competition requirements. As compensation for the expenses incurred, a budget of USD 400,000 will be divided in equal parts among all 6 to 10 competitors who advance to Stage 2. Thus, each competitor will receive an honorarium anywhere between USD 40,000 and USD 66,000. In addition, a total of USD 130,000 shall be awarded as prizes in Stage 2. Competitors of Stage 1 will additionally be reimbursed, for the accommodation expenses incurred for two nights by two persons attending the Stage 1 colloquium. Further, competitors of Stage 2 will additionally be reimbursed, for the travel and accommodation expenses incurred by two persons attending the Stage 2 colloquium. 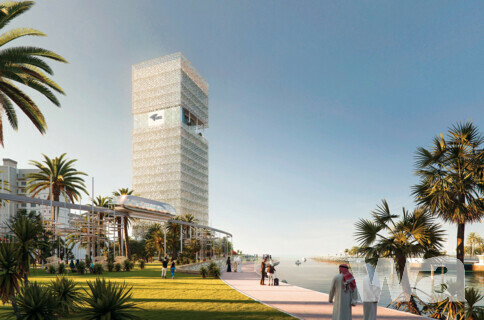 Acknowledging the recommendation issued by the jury, KFAS will commission one of the prize-winners, as a rule the first prize winner, or two prize-winners if the jury decides with unanimous vote to award separate first prizes for the two sub-projects (Headquarters and Convention Center), to further develop his or her design at least with the architectural services from preliminary design to construction design, provided that the project be implemented and that, in the promoter’s opinion, the costs of this prize winner’s competition entry stays within a reasonable limit, and the prize winner guarantees the proper execution of the requirements pertaining to further commissioning and in compliance with the Kuwait laws. The commission of the winning architect(s) may include landscape design services and/or engineering services and may include for these services the experts that have been consulting the prize-winning architect during the competition. April 16, 2018, 18:00 CEST. The selection will be based on three reference projects of the candidates. Information about the projects will include technical data and a collage of illustrations. Candidates are encouraged to prove both the comparability of their projects with the competition project and the location in the Arab region as well as the innovative character and quality of their design.